This is a slim case made by Griffin that offers drop protection of 6.6 ft. To us, this seems a little crazy since it’s so thin/slim and similar cases with that level of drop protection are easily 2-3 times the size such as the Ballistic Urbanite and Tough Jacket and they’re twice as thick as the Survivor Core! We’re big fans of the slimness of the case (if you haven’t noticed), the drop protection and the handling of your iPhone inside the case. There aren’t any fatal flaws to this case but we did notice it will definitely show more wear and tear than other cases and if you’re looking to get this case, we definitely wouldn’t recommend getting the white color. Find out why below! Based on our time with this case, we gave it a score of 4.5 Eh’s out of 5. This is now tied with the current reigning champion of slim cases with the Thule Atmos X3. We’ve rated it higher than the previous runner up, the Tech 21 Classic Shell. We do like it better than the Survivor Slim and it’s better than a Spigen Tough Armor and Speck Candyshell. If you’re wondering how this case fares against other cases, check out our comparison tool! Design – Fits well but it stains and scratches? In terms of design, the Survivor Slim will add a minimal amount of thickness and bulk around your iPhone. The case fits well together and the edges of the case are far enough away for the installation of a screen protector. The one issue we do have with the case is the quality of the materials on the case. First, the corners of our white case don’t look that white but you won’t have this problem on a dark coloured case. Our second issue with the design, this case is like a magnet for scratches. The back is made from this transparent plastic and it fits together really well but it scratches really easily. Now, for us, this scratching isn’t a big deal because the scratches are that noticeable because of the transparent back. When compared to other cases that are prone to scratching, such as the Spigen Tough Armor and Speck Candyshell, the scratching on the Griffin Survivor Slim is not as noticeable. Again, this is a highly rated iPhone case but the susceptibility of the back to scratches and potential for staining on the white version of the case may be a deal-breaker for some. 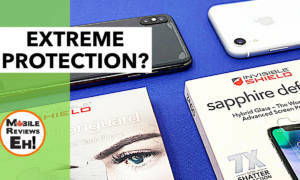 Protection – So thin and droppable? The perfect slim tough case? In terms of protection, again, super slim but is droppable from a height of 6 ft as we’ve demonstrated in our review video. The corners of the case extend out (similar to a Ballistic Urbanite) and provides extra protection for the iPhone. In terms of accessing your iPhone inside this case, you can easily get to all the hardware ports and buttons though we did notice that the buttons on my iPhone 6 sized case seemed to be a little tougher to get to but did improve during our test period for this Griffin Survivor Core Review. The cutouts for the Griffin Survivor Core are large enough to handle 3rd Party lightning cables and headphone jacks. The texture of the case makes it a joy to use your iPhone in the case. 1-handing your iPhone is much easier with the Griffin Survivor Slim. The case doesn’t follow the rounded edges of the iPhone but straightness, combined with the texture and materials of the case improves the handing of the case. We found that during long iPhone gaming sessions, our fingers didn’t fall asleep as much due to the shape and texture of the case. Getting to your iPhone’s touchscreen is very easy since the case doesn’t cover much of the screen. Have questions about our Griffin Survivor Core Review? Please ask them on our Google+ page or on our Facebook page. 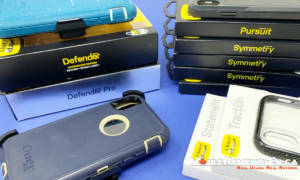 Griffin Survivor Strong vs. Griffin Survivor Endurance – Which one is the better iPhone case? What type of glass screen protector would you recommend with this case? I’m just about to do a roundup on screen protectors. Stay tuned. Hi Aaron, did you find it? I will put it on the list. I bought this case off the link on your page. Not sure if you get a commission off that, but I saved 15% with this coupon code on the Griffin Website- PCFY15. It’s a great case and I recommend it as well. does this case prevent the phone from bending when you put it inside your pocket?? Nope. With that being said, I haven’t found any case that would prevent bending…the closest would probably be a Thule Atmos X3 since its the most rigid iPhone case I’ve found so far. I just got this case based on your review of it and I really like it but the buttons are pretty stiff to press! Did you find the same issue with your cases and do you expect it to loosen up over time? Also, I’ve been watching your review videos for quite some time and i really hope your channel keeps growing because you give great, honest, and practical reviews that are surprisingly entertaining to watch. So thank you and keep up the fantastic work! I should read before I post, you addressed that in the full description. Thanks and keep it up! Thanks for the comment Vincent. The buttons do get better over time but they won’t come close to the response as a naked iPhone. I just bought this case off amazon and i was very impressed. i read your review and saw how easily the case scratched. but my case scratch in my empty pocket an edit was the first day. the scratch went very deep into the plastic where it started to bother me. i got most of it off with a eraser but it still very visible. so i warn anyone who likes their case perfect. I bought the black case after watching numerous videos by de Ho. thanks for the work. The thing that struck me immediately that I didn’t see you address at all in your video was the very “Slick” back and how you could play table top football with it it slides so easily. no grip at all. The front has some group, but without a screen protector, I don’t like placing the “6” face down in this case. Could you give us actual measurements that take into account its corners (outer dimension)? I’m not sure I can help with the dots. Just an update and testament to this product. This morning I accidentally knocked the phone into the bathroom sink while it was running. My phone was under a straight faucet for about 1.5 solid seconds. I grabbed it, took it out of the case, and wiped it down. The phone was working at 100 percent with now hiccups. I tuned it off and put it in rice for about an hour to be safe and its still working at 100 percent. I would like to think that the case protected the open ports from potential water damage. I also think I got extremely lucky. I hate replacing these phones- no matter how you do it your paying 100-200 for any damage. Hey there! Im looking for a case with a bit of a lip on it to help protect the screen bc I have a habit of shattering it. I was looking at this case as well as the Tuhle, would you recommend one over the other? Or anything else that comes to mind? Both of the lips of the case are pretty low. The Tech 21 Classic Shell has a higher lip. If shattering is an issue, consider getting a plastic screen protector (not glass). The Rhinoshield ones are pretty good. Thank you! Any plastic screen protectors you recommend? Hey Aaron can you please review the Body Glove Shock Suit?